Olga Zayakina from the village of Fedoskino created this charming oval box. 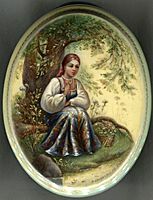 It depicts the Russian peasant girl sitting under the shade of a big tree. She has been gathering berries and flowers in the forest, and now she is taking a rest and looking at her reflection on the mirror like surface of the brook before coming back home. The composition is filled with various shades of green suitable for depiction of a summer scene. Gold paint is used to paint the patterns on the girl's sarafan, to highlight the tree's trunk, and also to outline some of the plants and leaves of the tree. The lid's edges are decorated with a simple golden ornament. More complex gold floral design accented with pink oils can be found wrapping around the box's sides. The box's exterior is covered with two tones of green oils that echo the green palette of the scene. Light green tones gradate into dark green tones from the box's top to its bottom. The box's interior is red. The box is constructed out of paper-mache. The box has a hinge from the left of the composition, and rests on a flat bottom. The work is signed, and dated by the artist.